Tsunade & Neji | American Pit Bull Terrier in Gardena. 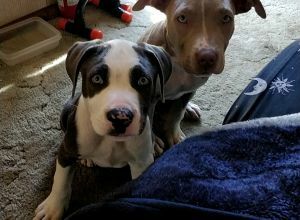 9 Week old pit bulls, brother and sister. Would love to socialize early on. Tsunade is the clesr leader, ready for most adventure but is a little timid around big exitable dogs. Brother Neji is much shyer, would love to see them blossom in confidence. I really would like to socialize my puppies while they are young.